The Amazing Heavenly and Earthly Journey of the Willamette Meteorite The Clackamas Indians' "Tomanowos" (Heavenly Visitor) comes to Oregon. Strange Journey: Further Travels of the Willamette Meteorite The 16-ton meteorite takes a ride in a horse-cart, goes to court, sails down-river to visit a fair in Portland, and finally arrives in New York City. Who Owns a Meteorite? In 1990, Oregon schoolchildren attempted to bring the Willamette Meteorite home in a campaign that went all the way to the US Congress. Yet Another Journey for the Willamette Meteorite? In early September 1999, the Confederated Tribes of Grand Ronde launched a campaign for the return of the Willamette Meteorite from New York, basing their claim on the Native American Graves Repatriation Act (NAGPRA). This Act--made law in 1990 and designed to restore sacred items to the various tribes--requires the return of cemetery and religious objects as well as human remains. In early December 1999, the city council of West Linn voted to support the Tribes' effort to restore the Meteorite to Oregon and offered to maintain it at a spot near its original location in the city. Meanwhile New York's Museum of Natural History plans to complete a $210 million renovation in February 2000. The Willamette Meteorite--valued by visitors and scholars for its scientific and educational significance--will have a prominent display in the new Hall of the Universe. A decision about ownership--a resolution of conflicting cultural, political, scientific and legal issues--will not be easy. 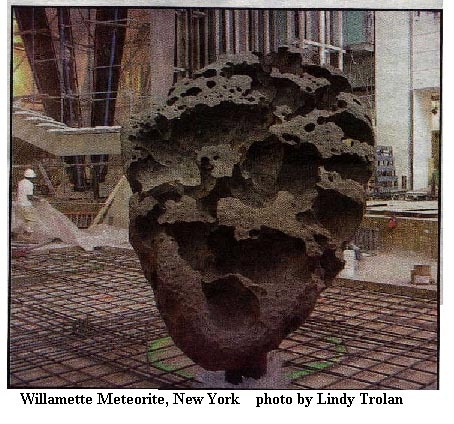 In the year 2000, the subject of the Willamette Meteorite may again go to court. On September 15, Ryan and Adrienne Heavy Head, repatriation consultants to the Grand Ronde Tribe, submitted a claim to the American Museum of Natural History asking for the return of a meteorite taken from Oregon. Up until the early 1900's, the meteorite was situated in the vicinity of present-day West Linn. The Clackamas Tribe called the meteorite "tomanowos." The stone belonged to the Native doctors of the Clackamas Tribe who told the people how it came from the moon. Native children, approaching adolescence, were often sent by their families to visit the tomanowos in the dark of night. Young warriors bathed their faces in the water which collected in caverns carved into the surface of the stone. The water had special healing properties and was used by Native doctors to cure friends and relatives. After the 1855 treaties, most Native families living in the Willamette Valley came to live in Grand Ronde, including the Clackamas Tribe. By the 1870's, with a tight government ban on traditional Native American religious practices, the Clackamas people went no more to the site of tomanowos. Kalapuya Elder William Hartless once told about the many strong spirit power sources which were available to Native people living in I the Pacific Northwest. According to William Hartless, these strong spirit beings fled to the ocean after the arrival of the Europeans and by the time of his interview, they came no more to the people at Grand Ronde. It would seem, in the case of the Oregon meteorite, the Clackamas tomanowos did not flee. It was taken from Oregon after it was sold by Oregon Iron and Steel for $20,600 to a wealthy woman from New York. Later, she donated it to the American Museum of Natural History where it still remains. Empowered under the language of the Native American Graves and Repatriation Act (NAGPRA), the Confederated Tribes of Grand Ronde submitted a claim to the American Museum of Natural History a few weeks ago calling for the release of the meteorite and the return of the tomanowos to the Grand Ronde community. However, much of the legal argument pertinent to this claim must still be addressed. In that respect, the Grand Ronde Cultural Resource staff will be intenriewing Elders and other knowledgeable persons in an attempt to accumulate any and all information which might be useful toward helping the museum understand why tribal people need the meteorite to return to its home. To expedite the issue, the American Museum has requested that this information gathering process be completed no later than November 30. As many Native people from Oregon and Southern Washington came to the Willamette Valley, on occasion, for trade and ·healing purposes, the staff at Grand Ronde is calling for assistance from anyone who may have information pertaining to the Clackamas tomanowos. Telephone or in-person interviews can be scheduled with Ryan and Adrienne Heavy Head, NAGPRA representatives for the Confederated Tribes of Grand Ronde. they can be reached by phone at (503) 393-7255, or by e-mail at hvyhead@cyberis.net. Where is the Willamette Meteorite Now? At its home far away from Oregon, in New York's American Museum of Natural History, the Willamette Meteorite is displayed to thousands of people each year. School-bus loads of children join the hundreds of tourists and the scores of scientists visiting the Museum, one of New York's prime attractions. By February 2000, a seven-story, 333,500-square- foot renovation at the Museum will surround the Meteorite. transform the entire north side of the Museum on West 81st Street, is an 87-foot sphere that appears to float within a 95-foot high glass walled cube." The sphere houses the new Planetarium, recreated as a virtual reality simulator, and the multi-sensory Big Bang Theater. Beneath the sphere, a sloping walkway (called the Cosmic Pathway) chronicles the 13 billion years of cosmic evolution after the Big Bang and leads down to the Hall of the Universe on the ground floor. The Hall of the Universe--the Willamette Meteorite's newest home--is designed to "illuminate the stunning discoveries of astrophysics" with "kinetic sculptures, computer visualizations, [and] dramatic projected images". Near the Meteorite, visitors can examine a self-sustaining habitat, the Ecosphere, to imagine conditions necessary for life in space, and view the AstroBulletin, a log of current space missions with up-to-date news and images from space. Museum-goers are invited to actually touch a visitor from beyond the Earth, the Willamette Meteorite, a 32,000-pound remnant of the birth of the Solar System.